Alright, this is going to be a quick review of something we've been meaning to get on the blog. Why does this look smaller than usual? Ahhh, it's just been too long. I took a bite of this and was transported back to my first magnum review I did. It seems like there is a certain complexity to the soft vanilla bean ice cream that I still haven't gotten use to. I double checked the ingredients but all it says is "natural flavor"... I wonder if there is a secret ingredient. Now, more importantly, we need to talk about the shell because on this particular box (that has a best by February 2015 date), something just wasn't right. My shell was very crumbly. Despite several attempts to get it to melt so I could get a better read on the flavor, it just kept fighting me and crumbling over and over again. I didn't really appreciate it. 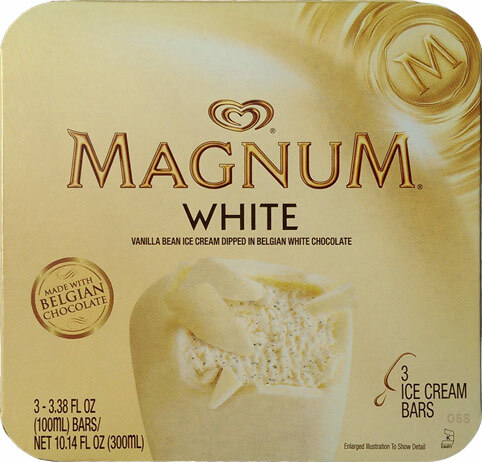 In fact, I was more than ready to bad mouth this product when Nick said the ones he sampled were much more in line with other Magnum varieties. 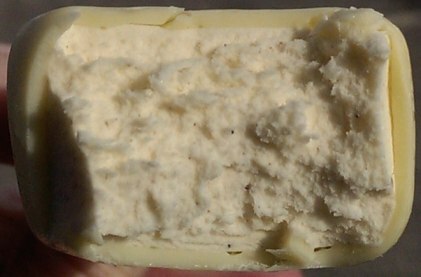 The problem is that the texture gets me thinking about the white chocolate you use for baking rather than the smooth and creamy white chocolate you expect in a candy bar. I just couldn't get in to this bar. Even with Nick saying the shell should be better, the overall flavor still lacks a certain pizazz for me. 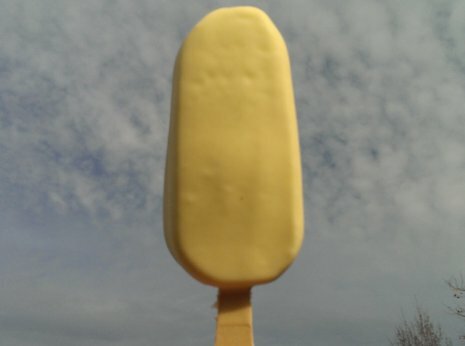 On Second Scoop: Ok, now I hate waiting, but I took Nick's comments under advisement and went back to my old trick of letting the magnum bar sit for a few minutes before eating. I didn't wait quite long enough because I was still experiencing some easy crumbling early on, but it did seem to help. See, what I'm going for here is for the white chocolate to melt on my taste buds and give me a nice overall flavor experience. This did start to happen, but not enough for it to click with me. I've been too spoiled by the other Magnum varieties. Oh, and I still think there is a hint of something (hot? spicy?) that creates this subtle aftertaste.... or maybe I'm just crazy. I too felt the white chocolate was off. I think I wanted it to be more like the Hershey's Cookies and Cream version of white chocolate. My fav is still the Gold and Double Chocolate. Hah too bad for the review. I love White Chocolate so I still want to try it but white on white might not be interesting. On another note, I just bought a new brand of Vanilla Cream protein powder that has a super spicey back and foreground taste, like pumpkin pie spice but just spicey and one note. Is that simjlar? yeah, it might be like that. there's definitely a little something extra in there. I too had envisioned hershey's C&C when I first dug in to this one. A softer, sweeter shell would have appealed more to the kid in me. One of my kids left an uneaten White Chocolate Magnum bar on a plate overnight. It didn't melt. I'm hesitant to eat any ice cream that is so artificial that it doesn't even melt at room temperature.